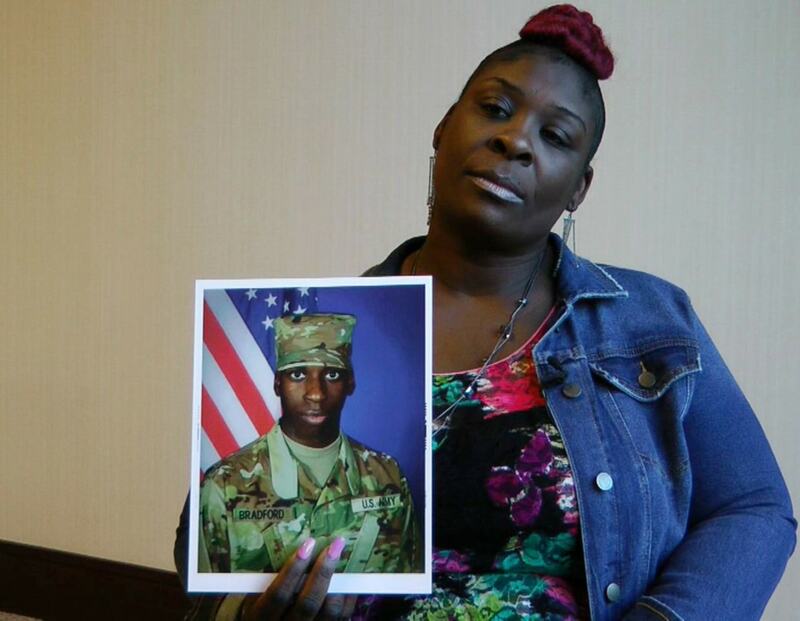 April Pipkins, holding a photograph of murder victim EJ Bradford Jr.
An Alabama police officer who fired shots that killed a 21-year-old man on Thanksgiving night at a mall outside of Birmingham will not face charges. State Attorney General Steve Marshall announced Tuesday that his investigation found that the officer did not break the law and will not be charged in the death of Emantic “E.J.” Bradford, Jr.
Just a reminder that Mr. Bradford was licensed to carry the weapon he carried. He was initially and wrongly identified as the mall shooter who started the episode. He had the misfortune of carrying a weapon while black in Alabama. As the torrent of innocent black blood continues to flow while cops who do the killing continue to be exonerated, none of us should be surprised at the rising rage against whites and white privilege among the black community. Authorities don’t have the courage or decency to even identify the killer in the media. Funny how every personal detail of claimed black and immigrant perpetrators is published all over the media the moment a crime happens, but when the perpetrator is a white cop than suddenly authorities have nothing to say. Another uniformed killer is exonerated while another black family grieves the killing of their precious child. Another reason why ANY civilized human being should stay as far away from Alabama as possible, regardless of race. Racism in Alabama is alive and well, as much as it was during the days of George Wallace.